Universal Pocket Bouncing Diffuser is useful for flash photographers who like to use bounce flash. 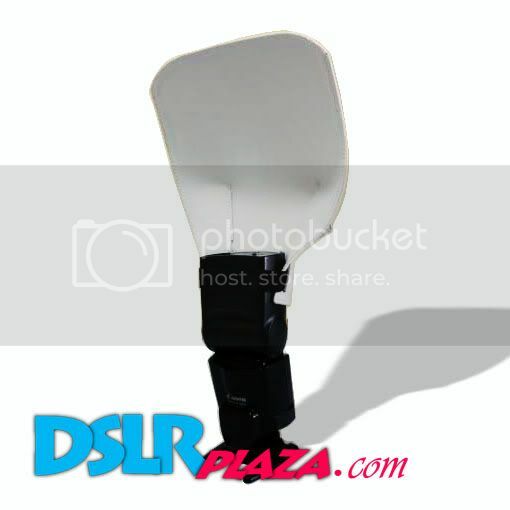 It allows photographers to create soft and well-distributed flash light without the reliance of wall or ceiling. At just 20cm x 18cm, its easy to carry around and light enough to be mounted onto your flashgun without increasing the overall weight of your already heavy gears. Application: To soften flash light quality with minimal light loss; to be used with slaves or alone where low ceilings are not available, or where more direct but soft fill light is desired.